Saskatchewan MP Erin Weir said today that he's switching his official political affiliation to the Co-operative Commonwealth Federation — a party that has been defunct since 1961. While Weir has said he still wants to rejoin the NDP caucus, he told CBC News that declaring himself a member of the CCF is a way to stay close to his social democratic values. "Being designated a member of the Co-operative Commonwealth Federation is a way of expressing commitment to social democracy while I remain outside of the NDP caucus," Weir said. The CCF was the NDP's predecessor. 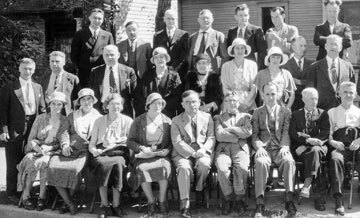 Founded in Alberta in the 1930s to represent labour groups and farmers, the party was dissolved in 1961 when it joined forces with the Canadian Labour Congress to form the New Democratic Party. Weir sad those priorities are still relevant today. "As a Saskatchewan MP, I'm trying to reflect the tradition that my family and many other Saskatchewan people were part of," Weir said. The CCF is not a registered federal party, according to the Parliament of Canada website. For the purposes of MPs declaring their affiliation, it doesn't need to be under Commons rules. But it's not clear what "affiliation" means. If you choose to be affiliated with something that still exists (and that something wishes to be affiliated with you) then it's clear enough. But if an independent says "I'm affiliated with a party that no longer exists" then what does that mean? Does it just mean that that independent supports what that party stood for? What if, in fact, they kind of don't (not accusing Weir here)? Can an independent claim affiliation with a party that DOES still exist? Can they claim affiliation with the party that turfed them, if that's how it went? I'm not entirely clear how this works. It sounds a little bit like saying "I've been adopted by this guy who died years ago. We're very much alike, and being his new son is preferable to being an orphan". As far as I know, if he's not part of the NDP cuacus, and doesn't have anyone else joining him in another party, he can only sit as an independent. So I assume that's what he's doing, and just using the informal "CCF" designation as a publicity stunt. That makes it sound as if the CCF was founded specifically as an Alberta party, which then spread to other provinces(like Social Credit). But my understanding is it was founded as a national party, and the founding convention just happened to be in Calgary. It is true that the Alberta UFA played a large role in the formation of the provincial CCF in Alberta. Not sure what their contribution to the federal party was. Weir obviously wants back in to the NDP. Not a bad strategy. 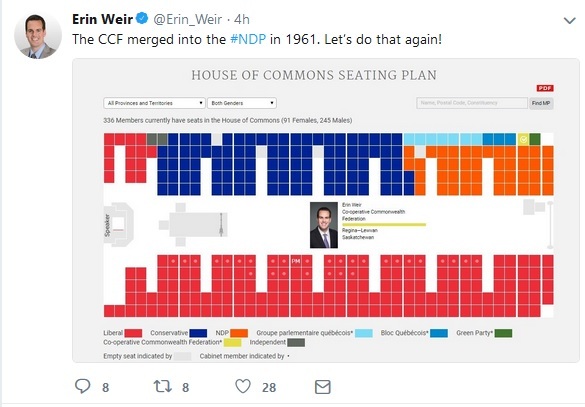 Erin Weir tweets "The CCF merged into the #NDP in 1961. Let’s do that again!" A lot of people, especially Baby Boomers and older, are accustomed to seeing the conjoining "CCF/NDP" in political writing. So this might be a good way for Weir to advertise that his values are still the same as the NDP, without sitting as a caucus member. That is, assuming it doesn't give rise to a lot of snickering along the lines of "Yeah, right, declare yourself a member of a party that doesn't exist, loser. I want what he's smoking." I think it was a smart move. He is reminding people of his politics, bringing attention back to it. I don't wish him ill.
Good for Erin. It's a statement that social democracy is not defined by some Leader and his secret cabal of handlers. In Canada, it means something greater. Didn't Mulcair remove all traces of socialism from the NDP at a convention before the 2015 election in order to appeal to Quebec? If this is the case then maybe bringing back the CCF would be a good idea and then maybe people will be able to express outrage again at what is going on in Palestine and Gaza. I think it was a smart move. He is reminding people of his politics, bringing attention back to it. Do you mean "bringing attention back to it" because he "affilitated" himself with the CCF a year ago? You could certainly bring the CCF back right now. Not that people cannot "express their outrage" without that. But at least Weir wouldn't be claiming membership in a club that no longer exists. Well you can express your outrage now in the NDP but just be prepared to be declined to run as a candidate. I guess that would be called freedom of speech with consequences. No, I mean back to his political beliefs and off the harassment topic. Quebecers don't like socialism? First time I've heard that inane theory. The CCF had some sort of progressive foreign policy? First time I've heard that inane theory. Maybe I'm wrong on both these points, but I'll need some heavy-duty evidence to convince me. I was wondering over the past few days when the riding association might say something about this. And there was discussion when this happened that it was an attempt to retain the NDP's support base in Quebec. Will find links to that later. More likely it was in order to appeal to Liberal voters. The one good thing Singh has done is his condemnation of Israeli’s murder of Gazan demonstrators. He could be even bolder, but then you can say that about the party as a whole. Yeah. I don’t know why that would have been Quebec specific. Maybe because they wanted to keep up their support levels in Quebec because they won all those seats in the Orange Crush. yes it would have be nice to gain seats elsewhere in Canada, especially in Ontario, but holding on to Quebec which has historically been partial to the Liberal party with a few exceptions like Diefenbaker's and Mulroney's sweeps of Canada, and with the Bloc not a major threat, the Liberals were their main opponent in Quebec. i can see it, but it was not for Quebec exclusively, but Quebec certainly did factor into it in a major way. I believe that as far as Commons affiliation goes, you can claim whatever you want so long as someone else hasn't already claimed it. So Weir could sit as Social Credit if he wanted to, but not as NDP, since that caucus has a leader and he's been expelled from it. This designation is essentially meaningless as the CCF isn't a registered party. Its the same as how some senators retained the Progressive Conservative designation after the parties merged into the Conservatives. Essentially an independent by a name he chose, which I suppose is his right. In anycase I think he sees the writing on the wall and that the door for coming back into caucus has closed. On the contrary. From the CBC article linked above (emphasis mine). Former New Democrat MP Bill Blaikie helped rewrite the preamble and spoke passionately in favour of modernizing the constitution. Blaikie said he had opposed the changes to the preamble in 2011 because he felt it lacked a reference to democratic socialism. Now, he says, it includes language taken straight out of Layton's letter to Canadians, released after his death. Other speakers argued the party would appeal less to Quebec voters and said that moving the party to the centre was the wrong move. Got this in my email tonight. Thank you to everyone who has reached out to express sympathy and encouragement for MP Erin Weir and his staff since his expulsion from the federal NDP caucus. We have been overwhelmed by the outpouring of support! Join Erin in two weeks for complimentary hotdogs, veggie dogs and drinks at our third annual constituency office BBQ from 12pm to 2pm on Saturday, May 26 at 2024 Albert Street, just north of the 13th Avenue Street Fair. As it happens, the BBQ date – May 26 – will be the 86th anniversary of the formation of the Co-operative Commonwealth Federation (CCF) parliamentary caucus. As reported by CBC and Postmedia, the Speaker has recognized Erin as a CCF Member of Parliament, reflecting his continued commitment to social democratic principles and to rejoining the NDP caucus. This past week, he was back in the House of Commons representing the people of Regina–Lewvan. On May 10, his member’s statement related the Saskatchewan Transportation Company to the same coalition of farm and labour interests that animated the CCF. On May 8, he proposed that the federal government extend its carbon levy to the carbon content of imports from countries that do not price emissions and rebate it on Canadian-made exports. Such border adjustments would reduce emissions without pushing facilities like Evraz Steel and the Co-op Refinery to relocate to places with weaker environmental standards. You can watch videos of these and other interventions on Erin’s Facebook page. Indeed. Quebec has never been antisocialist. If it had been, the PQ and BQ would not have had socialist or at least social democratic components in their programs. Let me try to clarify. The NDP held 50 seats in Quebec. They wanted to maintain those seats in Quebec, and if they felt that removing "socialism" from the constitution was going to hurt their position in Quebec they would not have deliberately sabotaged themselves by doing this. Bekayne said in post 18 that it was done likely to appeal to Liberal voters. I agree with bekayne on this. It was likely to appeal to Liberal voters. They also had 50 seats in Quebec and the Liberal threat in Quebec were very real to the NDP. so I mentioned QUEBEC ONLY BECAUSE THEY HAD 50 SEATS TO DEFEND AND THE LIBERALS WERE THEIR GREATEST THREAT. but yes, what bekayne said is what I also believe. They wanted to get the Liberal vote all over Canada. But they also had 50 seats in Quebec. Misfit: With respect, you're mistaken. An obscure theoretical meaningless reference to "socialism" in the constitution had nothing to do with winning or losing seats in Québec. Or elsewhere, I would venture to say. But especially not in Québec. Perhaps the main race in Quebec in 2019 will be between the Liberals and the Conservatives.